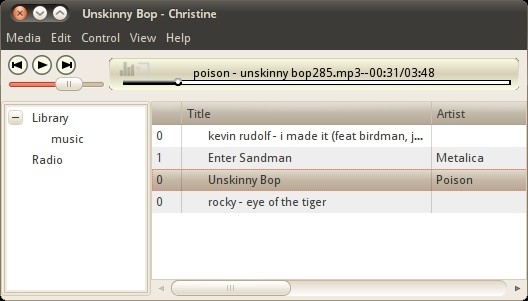 Christine is a small media player based on Gstreamer written in Python using GTK as GUI Tool Kit. The goal is to allow you to listen your music in a very easy way, by let you import your files and browse them. Christine is also commited with small resource consumption, that's why christine lacks of all that features that make another Media players shine. However a plugins method is still in development, which will allow users to create the perfect state of a player that they want, using as much or less memory as they want. Since it relies on both GTK and python, it’s better considered new and light on features than truly lightweight.